The rising awareness of bicycle and pedestrian issues in transportation planning has brought with it a new era of planning for these modes. Planning strategies range from small scale (such as a study to improve bicycle and pedestrian access to a neighborhood bus stop) to large scale (such as a statewide master plan for bicycling and walking). Additionally, bicycle and pedestrian planning includes planning provisions to make streets accessible for all users, including those with disabilities. Increasing the accessibility for users with disabilities increases the accessibility for all users. While there are some common elements (such as public participation) that nearly all bicycle and pedestrian planning projects should include, such projects otherwise can vary greatly, depending upon the particular situation. An effective, interconnected system of bicycle and pedestrian facilities requires planning at a variety of levels. This lesson provides an overview of bicycle and pedestrian planning issues, and it presents a variety of model master planning processes that can be used at various levels of government. 4.2 Federal Requirements for Planning. 4.3 Statewide and Regional Pedestrian and Bicycle Plans. 4.4 Local Bicycle and Pedestrian Plans. 4.5 Forecasting Bicycle and Pedestrian Travel Demand. 4.6 Using Models to Evaluate Roadway Conditions for Bicycling and Walking. 4.9 References and Additional Resources. As discussed in detail in lesson 1, section 5, government commitment and support has been critical to improving conditions for bicycling and walking throughout the United States. Efforts to plan for bicycle and pedestrian mobility were given a tremendous boost by the Intermodal Surface Transportation Efficiency Act of 1991 (ISTEA) and subsequent transportation legislation that has had a continuing emphasis on multimodal transportation. As a result of Federal legislation, States and metropolitan planning organizations (MPOs) are required to address bicycle and pedestrian needs during the transportation planning process. States and MPOs are required to incorporate appropriate provisions for bicycling and walking into the State transportation improvement program (STIP) and transportation improvement programs (TIPs). In addition, each State is required to establish a bicycle and pedestrian coordinator position in its State department of transportation (DOT). The American Association of State Highway and Transportation Officials (AASHTO) maintains an online list of current State bicycle and pedestrian coordinators on the AASHTO website at http://design.transportation.org/?siteid=59&pageid=852. The Federal Highway Administration (FHWA) and Federal Transit Administration (FTA) have issued technical guidance for bicycle and pedestrian planning at the State and MPO levels in order to meet Federal requirements. Plan elements should include goals, policy statements, and specific programs and projects whenever possible. The plan should identify financial resources necessary for implementation. Bicycle and pedestrian projects may be onroad or off–road facilities. Off–road trails that serve valid transportation purposes as connections between origins and destinations are considered eligible projects consistent with the planning process. Any regionally significant bicycle or pedestrian project funded by or requiring an action by FHWA or FTA must be included in the metropolitan TIP. Vision and goal statements and performance criteria. Assessment of current conditions and needs. Identification of activities required to meet the vision and goals. Implementation of the bicycle and pedestrian elements in statewide and MPO transportation plans and TIPs. Evaluation of progress using performance measures. Public involvement as required by Federal transportation legislation and FHWA/FTA planning regulations. Transportation conformity requirements for air quality, where necessary. At the State level, bicycle and pedestrian plans establish policies, goals, and actions for State agencies (i.e., within a State DOT and transit agencies) to accommodate and improve conditions for biking and walking. These plans often include design standards/guidance for local and regional governments, and they typically address education and safety issues as well. Public outreach that spans all geographic and jurisdictional regions of the State, and jurisdictional outreach that ensures the involvement of local stakeholders. Assessment of existing facilities, planning activities, programs, and policies. This may include extensive analysis of the current transportation system to identify deficiencies as well as an analysis of travel patterns and opportunities. Identification of policies and legal barriers to implementing bicycle and pedestrian improvements (including zoning and subdivision regulations) and development of strategies to address these barriers. Prioritization of locations needing improvements (based on existing conditions analysis and a relative assessment of demand), prioritization of programs, and other actions needed in order to support pedestrian and bicycle transportation. A phased implementation plan that identifies specific recommended actions, identifies the jurisdictions and/or agencies responsible for each action, assigns an estimated cost to each action, and identifies a timeframe for implementing the plan. Bicycle and pedestrian assessments and recommendations are often grouped together for planning projects but the needs of both groups are often quite different. For this reason, bicycle and pedestrian plans at the statewide level should include separate and distinct recommendations for each mode. Ensuring that proposed trails and bikeways are continuous, despite jurisdictional boundaries within the region. Resolving conflicting standards and philosophies among regional entities—each county or town may have somewhat different ideas about bicycle and pedestrian transportation and a different set of facility and street standards. Reconciling potential conflicts between local and regional perspectives, particularly when funding priorities are being established. Cities and towns with good bicycle and pedestrian plans can have a very positive impact on bicycling and walking conditions. Decisions at the local level often have a more direct and immediate impact on bicycling and walking because these two modes are affected to a great extent by localized opportunities and constraints. In order to compete successfully for Federal funding, the local entity must demonstrate a commitment to providing matching funds, and it should come equipped with the specifics of projects, cost–estimates, and other information. The city that does its homework has the best chance of securing the funds. It is important to recognize that there is no single, perfect formula for completing a local pedestrian and/or bicycle master plan. Successful planning processes are tailored to the needs and opportunities of a particular local area. A successful planning process for one city or town might be a failure somewhere else. Bicycle and pedestrian plans are inherently political and must respond to the opportunities and constraints of the government that develops them. Each planning process must begin with a strategic assessment of the critical path to success, and it should focus in on those activities, projects, and recommendations that are most likely to yield results. For example, if the jurisdiction is preparing to embark on a comprehensive revision of local zoning and subdivision regulations, a strategic approach would be to focus the work of the bicycle and pedestrian plan on developing very specific recommended policies that can be incorporated into the revisions. Public involvement among a wide variety of stakeholders. This can include neighborhood walkability audits, public workshops, survey questionnaires, interactive websites about the project, and other measures. Use of geographic information systems (GIS) to document locations of existing facilities (including sidewalk coverage, trails and bikeways, locations of destinations) and to indicate the conditions for bicycling and walking on existing roadways. Comprehensive review of transportation and land use policies and procedures in order to identify longstanding practices that make bicycling and walking difficult and specific recommendations for policy changes. Establishment of key design procedures in order to systematically retrofit environments which create barriers to bicycling and walking. Examples include instituting FHWA crosswalk guidelines (see lesson 11), establishing standard curb ramp designs that meet FHWA guidelines, and establishing a process for assessing repaving schedules to determine if bike lanes can be incorporated during restriping. Identification and prioritization of specific locations where improvements are needed, initially focusing on areas where bicycle and pedestrian activity is already prevalent but conditions are poor. The list of improvements may include: widening intersection crossings, closing gaps in the sidewalk or bikeway network, making small area plans for neighborhoods or specific commercial areas, identifying streets that are excessively wide and are candidates for road diets (narrowing the roadway to provide more space for bicyclists and pedestrians), and locating areas that need traffic calming improvements, etc. Of course, some projects are expensive. For instance, if there is a need for a grade–separated pedestrian crossing of a freeway, such a project can easily cost upwards of $300,000 to $500,000. Planning for such an expenditure can take several years and may involve grant applications or implementation through the TIP process and the use of any one of several categories of Federal funds. Meanwhile, many small but important changes can be made to improve conditions for bicycling and walking. Many local programs have found that small initial successes build momentum, allowing more ambitious work to follow. In one western community, for instance, installation of several test traffic circles on residential streets—a project that took several days of work and less than $5,000 to accomplish—helped build support for an ongoing program installing such circles all over town. Establish performance criteria for the bicycle network. Inventory the existing bicycle facility and roadway system. Identify desired bicycle travel lines and corridors. Evaluate and select specific route alternatives. Evaluate the finished plan against the established performance criteria. Accessibility: This is measured by the distance a bicycle facility is from a specified trip origin or destination, the ease by which this distance can be traveled by bicycle, and the extent to which all likely origins and destinations are served. Some communities (e.g., Arlington, VA) have adopted a criterion of having a bicycle facility within 1.61 kilometer (km) (1 mile (mi)) of every residence. More importantly, no residential area or high–priority destination (school, shopping center, business center, or park) should be denied reasonable access by bicycle. Directness: Studies have shown that most bicyclists will not use even the best bicycle facility if it greatly increases the travel distance or trip time over that provided by less desirable alternatives. Therefore, routes should still be reasonably direct. The ratio of directness to comfort/perceived safety involved in this trade–off will vary depending on the characteristics of the bicycle facility (how desirable is it? ), its more direct alternatives (how unpleasant are they? ), and the typical user’s needs (in a hurry? is it a business or pleasure trip?). Continuity: The proposed network should have as few missing links as possible. 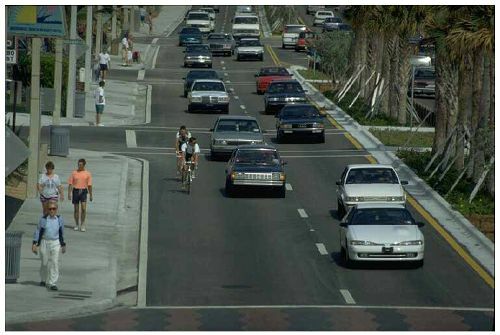 If gaps exist, they should not include traffic environments that are unpleasant or threatening to group B/C (basic and child) riders, such as high–volume or high–speed motor vehicle traffic with narrow outside lanes. Route attractiveness: This can encompass such factors as separation from motor traffic, visual aesthetics, and the real or perceived threat to personal safety along the facility (see figure 4–1). Low conflict: The route should present few conflicts between bicyclists and motor vehicle operators. Cost: This would include the costs both to establish and to maintain the system. Ease of implementation: The ease or difficulty in implementing proposed changes depends on available space and existing traffic operations and patterns. Figure 4–1. Photo. Group B (basic) bicyclists value designated bike facilities such as bike lanes. Inventory Existing System. Both the existing roadway system and any existing bicycle facilities should be inventoried and evaluated. The condition, location, and level of use of existing bicycle facilities should be recorded to determine if they warrant incorporation into the proposed new network or if they should be removed. If existing bicycle facilities are to be used as the nucleus of a new or expanded network, the inventory should note which improvements to the existing portions of the network may be required to bring the entire new network up to uniform design and operations standards. A simple inventory of the roadway system could be based on a map of the annual average daily traffic (AADT) counts on each road segment within a community or region. A more complex inventory could include factors such as the number of traffic lanes, the width of the outside lane, the posted speed limit or actual average operating speed, the pavement condition, and certain geometric and other factors (e.g., the frequency of commercial driveways, grades, and railroad crossings). Identify Bicycle Travel Corridors. Predicting bicycle travel corridors for a community is not the same as identifying the routes that bicyclists currently use. Instead, travel corridors can be thought of as desire lines connecting neighborhoods that generate bicycling trips with other zones that attract a significant number of bicycling trips. For motor vehicle traffic, most peak morning trips are made from residential neighborhoods to employment centers. In the evening peak hours, the reverse is true. Furthermore, in the evenings or on weekends, the patterns of trip generation are much more dispersed, as people travel to shopping centers, parks, and the homes of friends or relatives. Estimating these trip flows for an entire city can be a complex, time–consuming effort requiring significant amounts of raw data and sophisticated computer models. Fortunately, transportation planning for bicycles is much simpler. Unlike traditional transportation planning that attempts to predict travel demands between future zones on as–yet unbuilt streets and highways, bicycle planning attempts to provide for bicycle use based on existing land uses, assuming that the present impediments to bicycle use are removed. These desire lines are, in fact, well represented by the traffic flow on the existing system of streets and highways. In all of this, the underlying assumption is that people on bikes want to go to the same places as do people in cars (within the constraints imposed by distance), and the existing system of streets and highways reflects the existing travel demands of the community. Furthermore, most adults have a mental map of their community based on their experience as motor vehicle operators. Thus, they tend to orient themselves by the location of major streets and highways. Schools (especially colleges and universities) and military bases can generate a disproportionately large share of bicycle trips. This is especially true for campuses where motor vehicle parking is limited. Parks, beaches, libraries, greenways, rivers and lakesides, scenic roads, and other recreational facilities attract a proportionately higher percentage of bicycle trips. Evaluate and Select Specific Route Alternatives. The corridor identification procedure identifies desire lines for bicycle travel between various locations. The next step is to select specific routes within these corridors that can be designed or adapted to accommodate group B/C bicyclists and provide access to and from these locations. The aim is to identify the routes that best meet the performance criteria established in the first step of this planning process. Typically, this step and the selection of appropriate design treatments are highly interactive processes. The practicality of adapting a particular route to accommodate group B/C bicyclists may vary widely depending upon the type of design treatment selected. For example, a less direct route may become the best option if comparatively few inexpensive and easily implemented design improvements are required.Therefore, steps 4 and 5 should be approached as an iterative loop in which both route selection and design treatment are considered together to achieve a network that is highly advantageous to the user, is affordable, has few negative impacts on neighbors and other nonusers, and can be readily implemented. Therefore, steps 4 and 5 should be approached as an iterative loop in which both route selection and design treatment are considered together to achieve a network that is highly advantageous to the user, is affordable, has few negative impacts on neighbors and other nonusers, and can be readily implemented. The degree to which a specific route meets the needs of the anticipated users as opposed to other route options. The possible cost and extent of construction required to implement the proposed bicycle facility treatment. The comparative ease of implementing the proposed design treatment (see figure 4–2). For example, one option may entail the often unpopular decision to alter or eliminate on–street parking while another does not. The opportunity to implement the proposed design treatment in conjunction with a planned highway construction or reconstruction project. Figure 4–2. Photo. Several factors will determine the final design treatment used; two of the foremost are cost and controversy. The design bicyclist: Is the proposed route projected to be used primarily by group A (advanced) bicyclists, or is it intended to also serve as part of a network of routes for group B/C bicyclists? The type of roadway project involved with the selected route: Is the roadway scheduled for construction or reconstruction, or will the incorporation of design improvements be retrofitted into existing geometrics or right–of–way widths? Average motor vehicle operating speeds. Number of intersections and entrances. Evaluate the Finished Plan Against the Established Performance Criteria. Will the proposed network meet the criteria established at the start of the planning process? If it does not meet most of these criteria, or it inadequately meets a few critical goals, either the proposal will require further work, or the performance criteria must be modified. In the latter case, the planning process as a whole should be reviewed to determine if previously discarded routes should be reconsidered. There may now be more preferred options in light of the newly modified criteria. The bicycling and walking modes have experienced decades of neglect in mainstream travel demand forecasting. As cities and towns begin the work of redeveloping their transportation systems to support bicycling and walking, the list of needed improvements far outstrips available dollars. Planners have begun to look for ways to set priorities—one of which is predicting demand. The question that planners have begun to ask is this: If we build this bikeway (or walkway, etc. ), how many people can we expect to use it? Finding the answer is the fundamental aspect of predicting demand. Transportation planners have been asking (and answering) this question for motor vehicular travel since the late 1960s, when the first travel demand models were developed. By contrast, bicycle and pedestrian researchers are only just beginning to scratch the surface on these topics. For bicycles and pedestrians to have a seat around the transportation table, it is important to acknowledge that some level of analysis must be done for these modes. Transportation planners have a responsibility to ensure that public funds are being spent wisely—in locations where a larger number of people will benefit from new facilities. Finally, there is a growing trend to quantify the air quality benefits (and congestion relief) that can be expected as a result of congestion mitigation and air quality (CMAQ) projects. For bike and pedestrian facilities, this means coming up with some way to determine how many auto trips will be shifted to biking and walking trips. Existing conditions and gaps in the network result in fewer users—potential users are deterred by dangerous conditions. Dispersed land uses create trip distances that are perceived as being too far to make on foot or by bicycle. For an intuitive (i.e., sketch plan) approach, destinations throughout the study area that would attract bicyclists and pedestrians are shown on a base map. Routes are selected that serve higher concentrations of destination points or that serve destinations that typically yield high numbers of bicyclists and pedestrians, such as universities, downtown areas, shopping centers, major employment centers (hospitals, business parks, major industries, and corporations, etc. ), schools, and parks. Route selection and prioritization can be done via graphical representation; the intent is to identify locations that serve multiple destinations and higher population densities (population densities can be obtained from census data). This methodology can be accomplished using GIS, or it can be done by hand. Public involvement is important to the success of the intuitive method. It is particularly important to gain input from a wide variety of local citizens (representing different geographic areas) who represent all ages and abilities. The other method of estimating latent bicycle and pedestrian travel demand is to adjust conventional motor vehicle travel demand theory so that it applies to bicycle and pedestrian travel. By using a gravity model to measure latent bicycle and pedestrian travel demand, the planner can achieve results that are more precise than the intuitive approach. Another advantage to this approach is that it complements the type of analysis that is typically done for motor vehicle and transit travel simulation. This can be particularly important in cases where bicycle improvements are competing for similar funding mechanisms as other modes, since most TIPs make funding decisions based upon quantifiable results. Level of service (LOS) is a framework that transportation professionals use to describe existing conditions (or suitability) for a mode of travel in a transportation system. The traffic planning and engineering discipline has used LOS models for motor vehicles for several decades. Motor vehicle LOS is based on average speed and travel time for motorists traveling in a particular roadway corridor. In the 1990s, new thinking and research contributed to the development of methodologies for assessing levels of service for other travel modes, including bicycling, walking, and transit (see figure 4–3). Figure 4–3. Photo. Streets and roadways can be analyzed to determine the relative level of service they provide to bicyclists and pedestrians. Specific methodologies for bicycle LOS have been developed and used by a number of cities, counties, and States since the mid–1990s. 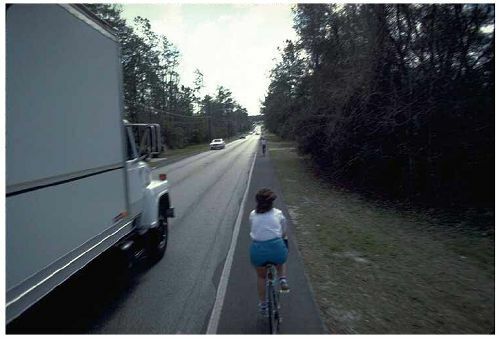 There are two models that have been established and are widely used for evaluating bicycling conditions in the United States: one that was developed by FHWA and the other developed and tested by the Florida DOT. When considering LOS in a multimodal context, it is important to note that LOS measures for motor vehicles and bicycles are based on different criteria and are calculated using different inputs. Motor vehicle LOS is primarily a measure of speed, travel time, and intersection delay. Bicycle LOS is a more complex calculation that represents the level of comfort a bicyclist experiences in relation to motor vehicle traffic. Bicycle LOS is an evaluation of bicyclists’ perceived safety and comfort with respect to motor vehicle traffic while traveling in a roadway corridor. It identifies the quality of service for bicyclists or pedestrians that currently exists within the roadway environment. In order to evaluate bicycle LOS, a statistically–calibrated mathematical equation is used to estimate bicycling conditions in a shared roadway environment. It uses the same measurable traffic and roadway factors that transportation planners and engineers use for other travel modes. With statistical precision, this modeling procedure clearly reflects the effect on bicycling suitability or compatibility of factors such as roadway width, bike lane widths and striping combinations, traffic volume, pavement surface condition, motor vehicle speed and type, and on–street parking. The form of the bicycle LOS model is provided as shown below in figure 4–4. Figure 4–4. Equation. Bicycle LOS. (a1–a4) = coefficients established by the multivariate regression analysis. The bicycle LOS score resulting from the equation is prestratified into service categories A, B, C, D, E, and F (A being the best and F, the worst), according to the ranges shown in table 4–1 that reflect users’ perceptions of the road segments’ LOS for bicycle travel. This stratification is conducted in accordance with the linear scale established during the research project that identified bicycle participants’ aggregate responses to roadway and traffic stimuli. Table 4–1. Bicycle level LOS categories. The model is particularly responsive to the factors that are statistically significant. An example of its sensitivity to various roadway and traffic conditions is shown in figure 4–5. Because the model represents the comfort level of a hypothetical typical bicyclist, some bicyclists may feel more comfortable and others may feel less comfortable than the bicycle LOS calculated for a roadway. A poor bicycle LOS grade does not mean that bicycles should be prohibited from using a roadway. Conducting a benefits comparison among proposed bikeway/roadway cross–sections. Identifying roadway restriping or reconfiguration opportunities to improve bicycling conditions. Prioritizing and programming roadway corridors for bicycle improvements. Documenting improvements in corridor or system–wide bicycling conditions over time. Figure 4–5. Equation. Bicycle LOS sensitivity analysis. County, State, or regional bicycling guides. City or county planning maps. The first three are used mainly by bicycle riders; the fourth, by a wide variety of interested parties. Used primarily by local utilitarian bicyclists, newcomers, and visitors, this type of map is intended to help cyclists choose routes they feel comfortable riding and to encourage first–time riders to make trips by bicycle (see figure 4–6). All streets should be shown. A simple color code indicates the presence and types of bicycle facilities. It also warns bicyclists of roads they should use with caution. The accompanying text should provide information on traffic laws, safety tips, and the proper use of bikeways. Figure 4–6. Illustration. A bicycle route map provides bicyclists with information about street characteristics by using different color codes. Other useful information includes enlargements of difficult intersections, steep hills, weather data, parking facilities, bike shops, important destinations, and landmarks, etc. However, too much detail creates a cluttered effect; simplicity makes it easier to find needed information. The intended audience is recreational and touring riders interested in medium– to long–distance trips. The major concerns when choosing a route are traffic volume and roadway conditions. Color coding indicates bicycle level of service; a solid line indicates the presence of shoulders wide enough for bicycle travel. The map should include State highways and county roads. The level of detail is less than that on an urban map. Other information to be included are distances, grades, weather data (especially prevailing wind directions), and camping facilities. Text should be used for information on local history, landmarks, viewpoints, etc. Description of loop tours is useful to riders planning day trips. Local bicyclists should ride the loops in order to assess conditions. A written description of the route that lists landmarks and turns is helpful. Since bicycle trips often cross jurisdictional boundaries, counties are encouraged to coordinate when creating regional maps that cover natural geographical areas within easy reach of multiple population centers. For urban maps, all city streets should be shown, as well as schools, public agencies, and other common destinations. But not every street needs to be labeled for bicycling purposes. Most residential streets and minor collectors function well as shared roadways and can be shown but not labeled on the map. For bicycling guides, too much topographical detail obscures useful information. For tour guides, inclusion of all roadways in the vicinity creates a confusing, web–like effect. Only the roads on the tour need to be included, along with roads that connect the route to other localities (for riders who wish to join or leave the route at intermediate points). Insets of urban areas are useful. It is usually better to create a new map. If available graphics capabilities don’t allow this, existing maps can be used by adding and deleting information. Symbols and text should orient in the direction the map will be held (if possible, north at the top). Descriptive text should be placed as close as possible to the relevant map segment (especially important for tour guides). Find bicycle and/or pedestrian planning guidelines for your city, county, or State. Also find plans from another region with comparable characteristics. What are the major elements of your local plan? From the plans, what can you determine is important to the area? Compare the two sets of plans and evaluate your plan’s strengths and weaknesses. Guide for the Development of Bicycle Facilities, AASHTO, Washington, DC, 1999. Burden, D. and B. Drake, Pedestrian and Bicyclist Safety and Accommodation (Participant Workbook), FHWA–HI–96–028, National Highway Institute, Arlington, VA, 1996. 1995 Nationwide Personal Transportation Survey, available online at http://npts.ornl.gov/npts/1995/doc/index.shtml, accessed August 12, 2005. NHTS, available online at http://www.bts.gov/programs/national_household_travel_survey/, accessed August 12, 2005. Guidebook on Methods to Estimate Non–Motorized [sic] Travel: Overview of Methods, Federal Highway Administration, Publication No. FHWA–RD–98–166, Washington, DC, 1999. Bicycle LOS Software User’s Manual, Sprinkle Consulting, Inc., Lutz, FL, no date. Landis, Bruce W. et al., “Real–Time Human Perceptions: Toward a Bicycle Level of Service” Transportation Research Record 1578, Transportation Research Board, Washington, DC, 1997. Oregon Bicycle and Pedestrian Plan, Oregon Department of Transportation, June 1995. Pinsof, S. and T. Musser, Bicycle Facility Planning, PAS 459, American Planning Association, Chicago, IL, 1995. “Policy and Planning Page,” Pedestrian and Bicycle Information Center, Available online at http://www.bicyclinginfo.org, accessed April 20, 2004. 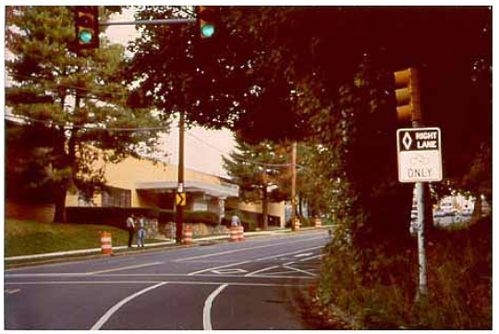 Toole, J., and B. Zimny, “Chapter 16—Bicycle and Pedestrian Facilities,” Transportation Planning Handbook, Institute of Transportation Engineers, Washington, DC, 1999.